The recently released Aquaman trailer did not show off Jason Momoa in the classic gold and green costume, but there's some new coloring and activity books on the way that feature the original suit on the covers, along with King Atlan's trident, which was also not shown in the trailer. 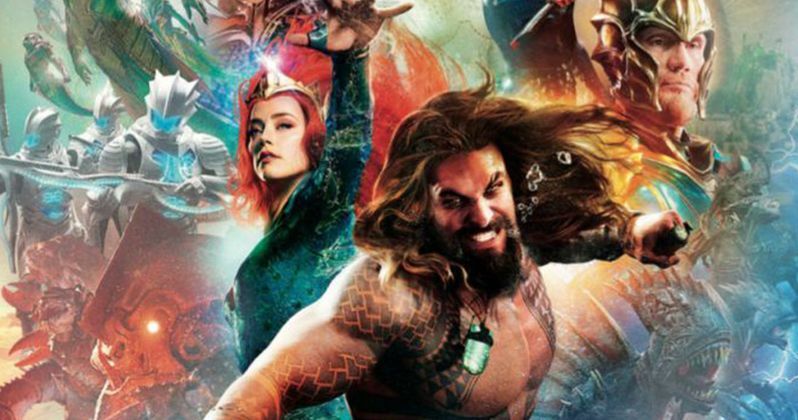 We've seen Momoa in the green and gold suit from action figures and statues, but only hints have been shown in promotional material for the highly anticipated film. So far, Arthur Curry has been seen in different armor and without a shirt in the Aquaman trailer and TV spots. There's a good reason as to why we haven't seen the green and gold Aquaman suit in the Comic-Con trailer, and that's because Arthur Curry does not obtain the suit until the end of the movie. James Wan, along with the studio, are more than likely weary of giving away too much about the climactic finale. But, we do know that Curry is on the hunt for King Atlan's trident and the new book artwork reveals that Curry's mission might be a success. Aquaman is all set to be the first DCEU movie to be released since last year's poorly received Justice League. DC and Warner Bros. are hoping for a home run like Wonder Woman at the box office with Arthur Curry's origin story. James Wan and Jason Momoa have worked hard to make the Aquaman character cool, instead of the superhero that gets made fun of all of the time for talking to fish. Wan was hesitant to take the project on at first, but now likes that they have taken an underdog character and morphed him into something new and different. DC and Warner Bros. recently held test screenings for Aquaman, and as usual, the results have been varied. There have been echoes of "good, not great," as well as comparisons to a Marvel Cinematic Universe Phase 1 film, which is interesting. Regardless, DC fans are going to flock to the theaters, and many will be female, according to recent projections. Aquaman is testing high with female audiences, which may have a lot to do with Jason Momoa's physique and not his classic green and gold costume from the comic books, but could also have to do with the success of Wonder Woman. Aquaman opens in theaters on December 21st, over a year after Justice League hit theaters. It will be interesting to see how DC fans will react to this new Arthur Curry origin story. Jason Momoa already looks way cooler than Curry ever looked before in the comics and cartoons, but will a cool character be enough to carry the whole movie? That remains to be seen, but the trailer certainly looks promising and the early reviews do as well. While we wait, you can check out the new, albeit low resolution, pictures of the classic gold and green suit below, thanks to the Aquaman Shrine Twitter account.